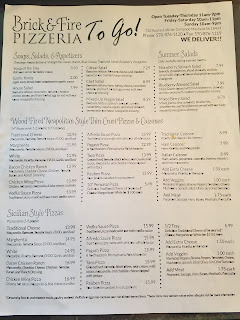 I had been hearing rumblings for a couple months that there was a new pizzeria serving up wood-fired pizza on route 6 out past Eynon and if there is one thing that peaks my interest is wood-fired pizza because it provides so much flavor and really a whole different type of pizza than the traditional gas-fired brick oven. After verifying on facebook where the place was, I hopped in the pizza mobile and headed out. It was a pretty simple find, directly on Route 6 in what I think is Mayfield. 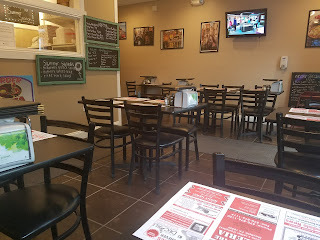 It's in a small strip mall, and one exciting thing I noticed right away was that there was an alleyway next to the building that had a patio with some tables and umbrellas for outdoor dining. I walked in and was put at ease by the small but comfortable and modern dining area. This pizzeria is now closed. 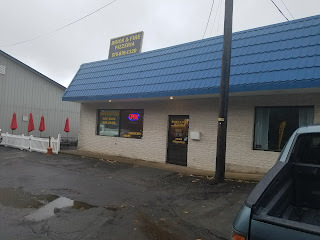 I was greeted by who I eventually found out was the owner, who provided excellent service and is a super nice guy. 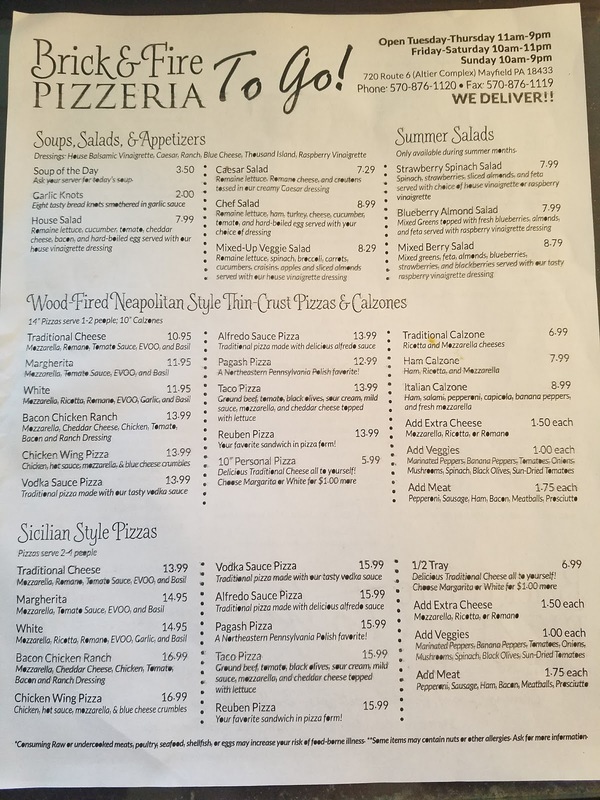 I placed my order for a traditional 14" cheese pizza which is says it will feed 1-2 people. Typically a 14" pizza feeds 2-4 people, so I assumed this pizza was going to be pretty thin. The owner took my order and had a pizza at my table within 4 minutes which was very, very impressive! 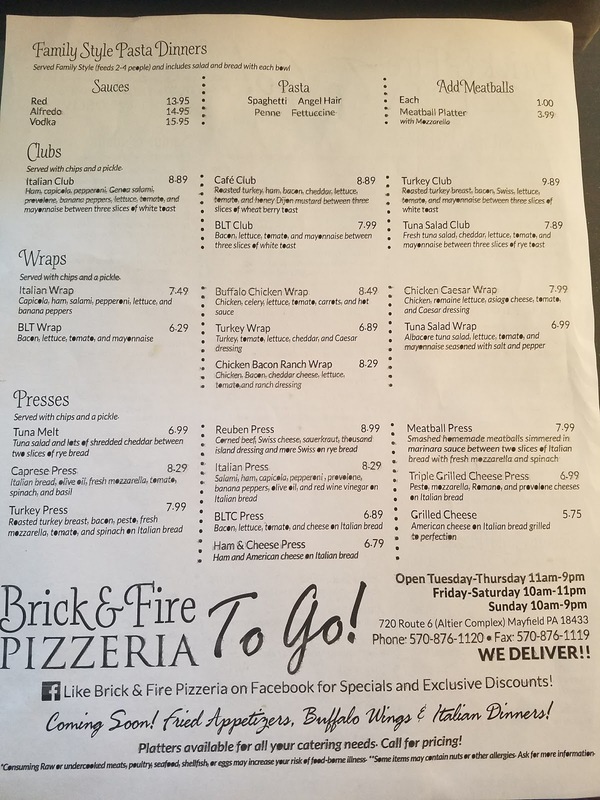 During those quick 4 minutes, I took a look at the menu and noticed that Brick and Fire does offer Delivery service and their menu is expected to expand in the near future with Sicilian Pizza, fried appetizers, buffalo wings, and Italian dinners. When the pizza came out, it looked fantastic. The crust was razor-thin and very flexible, but had an incredible texture and flavor. The wood-fired smoky flavor was evident, but not overpowering - exactly how I like it. 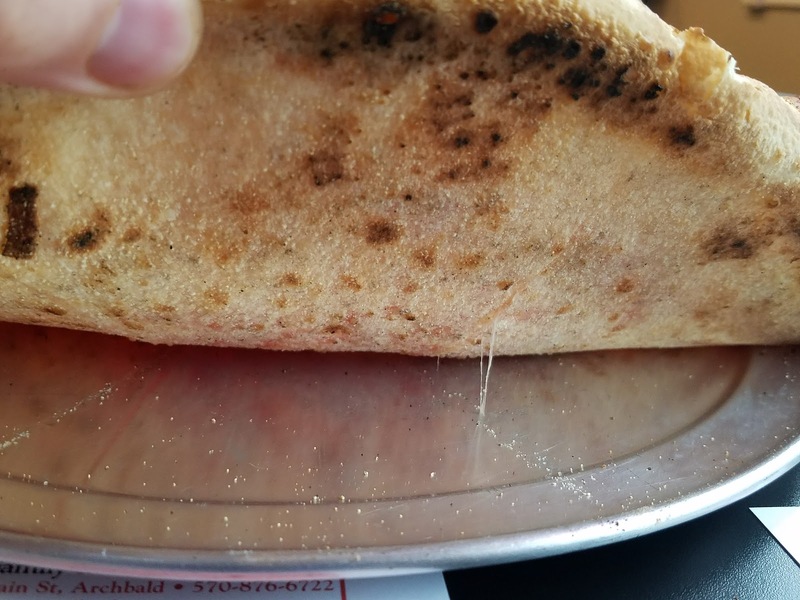 I also appreciated how the dough was slightly crispy, but not burned. It was really a light and delicate crust that was very pleasant. 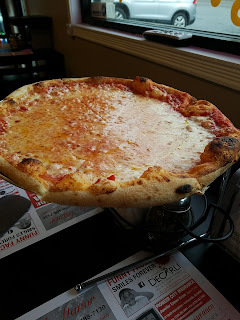 I don't have much experience working with wood-fired ovens myself, but I learned that they are heated to 850 to 900 degrees Fahrenheit and have very tight cooking windows and the pizzas are easy to screw up if you pull it out 10 seconds too early or too late. 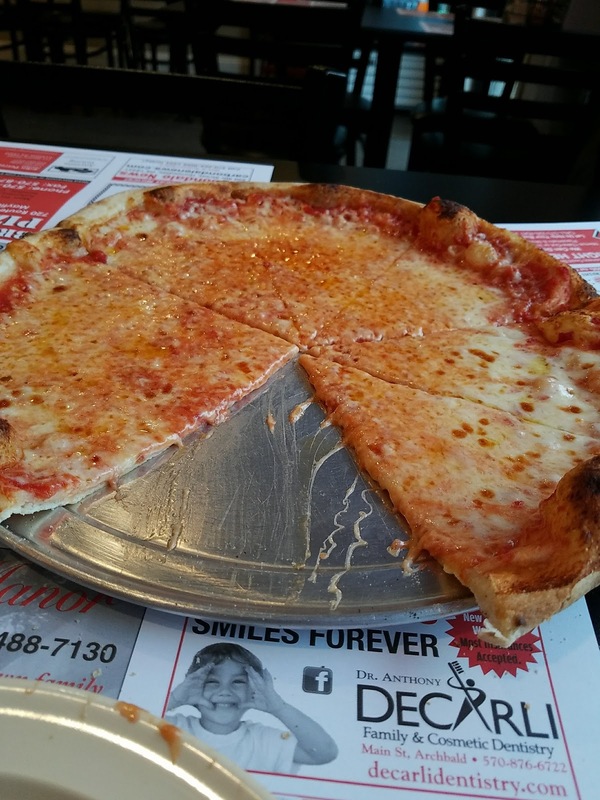 The cooking time is only about 2 minutes so every second counts, and this pizza was cooked to perfection. The sauce was pretty vibrant with a very slightly chunky texture, a fresh flavor, and just let the tomatoes do the talking instead of overseasoning. It had a lovely balance and blended well with the cheese on top. The cheese was a bit greasy, but it was oh so flavorful. 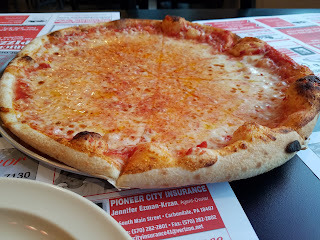 I really enjoyed the combination and I was certainly impressed by the construction and cooking of this pizza. Brick and Fire has been in business since March of 2016, and if you have not gotten there to try the pizza yet, you really should! 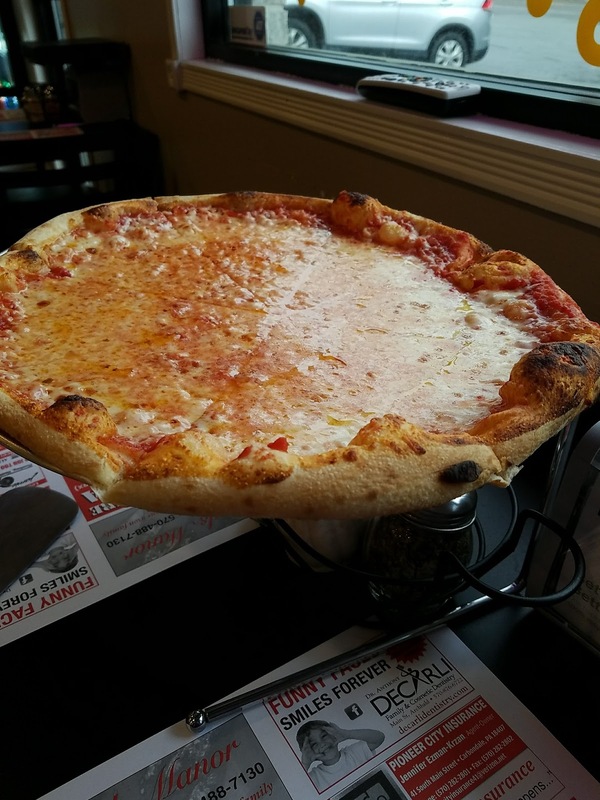 It's a small pizzeria that has much more than pizza. They offer soups, salads, sandwiches, pasta, and wraps as well. They also have many daily specials that are published through their facebook page. 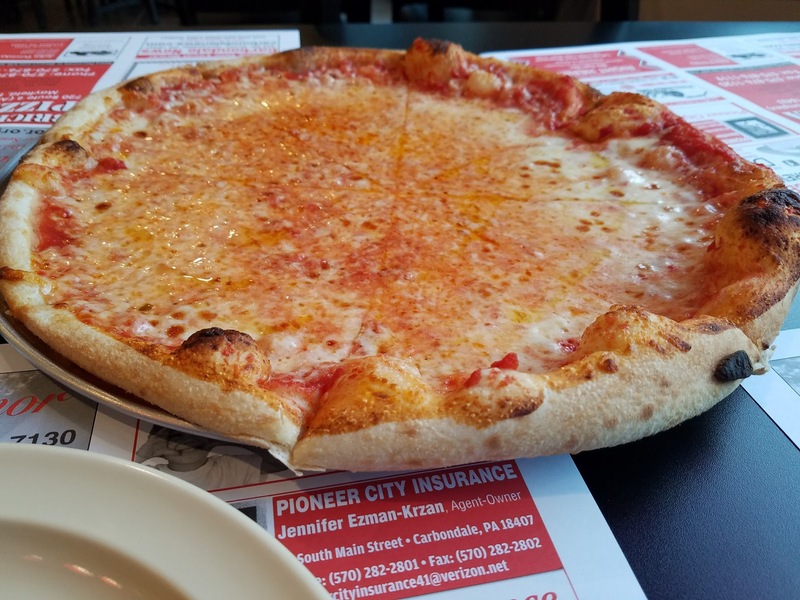 Their most popular pizza is the white pizza with tomato, which I plan to take the First Lady of NEPA Pizza on a pizza date to try in the near future! For those who like an upscale pizza without the full commitment to a ton of smoky flavor that some of the neopolitan pizzas have, this pizza is for you. 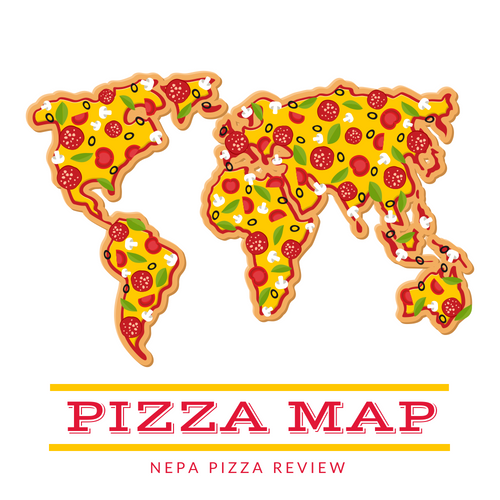 This is a pizza that children and adult pizza snobs alike can enjoy and is sure to satisfy a broad spectrum of taste buds. 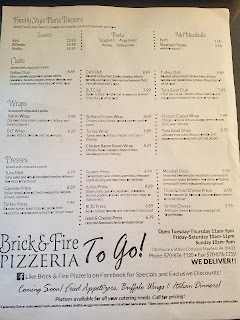 I highly recommend Brick and Fire Pizzeria to the NEPA Nation.